Tourists traveling in Vietnam today never see the reality of daily life for most people living in Vietnam. Most of the people of Vietnam live in the countryside away from the tourist spots and the lives of those people who survived the American war are defined by pain, suffering, hardship and sorrow. Despite the impact the war had on their lives, most Vietnamese people have the strength to continue rebuilding their lives, families and communities after the war. There are, however, some women and their families whose suffering is so extreme as to be unimaginable.They can only live day-to-day, their lives a parody of human existence. The conditions of their lives are such that they cannot hope to lift themselves out of the despair that defines their lives. For women such as these, the Madison Quakers have been building what the Vietnamese call ‘compassion houses’. These two room compassion houses are constructed of brick and cement with cement floors and metal roofs. For women who had been living in ‘houses’ made from mud or weeds or scraps of wood and plastic having a house that won’t melt under the monsoon rains or blow apart during high winds is beyond their imaginations. For the first time in their lives, they are safe—safe from wind and rain, safe from insects and snakes. For the first time in their lives they have hope. As of 2011, MQI has funded more than 100 Compassion Houses. Since the first one in 2005, they have also become a means for bringing other groups of people to Vietnam to engage with the Vietnamese people. 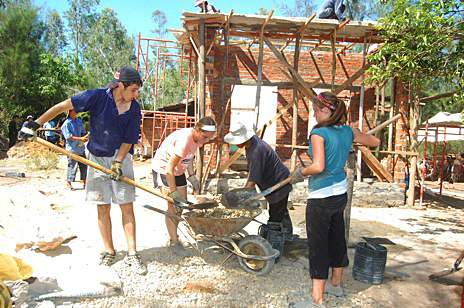 The construction of a Compassion House creates the opportunity for community involvement. Neighbors bring what they can for the construction of the house; a few bricks, wood for rafters or their own labor. In 2006 MQI introduced Putney Student Travel to the provincial government authorities in order for PTS to bring tenth and eleventh grade students from the U.S. to work on Compassion Houses. These American students are taught by Vietnamese construction workers how to mix cement, lay bricks, apply cement veneer and so on. However, the value these students bring to this work is not the actual construction of the house, but the relations they build with the local Vietnamese. Much hatred exists in Quang Ngai province– another legacy from the war. But when the American students arrive, the villagers see them as they see their own children and treat them as such. Vietnamese women make sure they have enough water to drink and that they don’t work too hard. The local villagers watch as the American children play with their own children and slowly but inevitably the hatred begins to turn to love. American high school students help build a Compassion House in Tinh Hoa village. Mrs. Nguyen Thi Cat is one of these women. 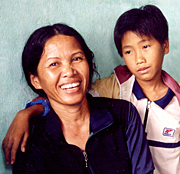 I met Mrs. Cat last year, in March, 2005, while visiting Pho Thanh village where one of our loan fund programs is located. She was married with three children. However, her husband was mentally ill as were two of her three children. Her “house” was a collection of scraps (pieces of tin or boards or a few yards of plastic tarp), some scavenged by her and her family while other bits of scrap were given to them by neighbors. There were no beds, she and her family slept on mats on the sand floor. What income she derived from her meager business selling fish was inadequate to pay for all the medicine needed for her husband and children. It was impossible for her to move beyond the conditions of her life. Maybe Mrs. Cat had experienced hope at one time in her life. Maybe when she was young and strong and newly married she knew hope. But life had long since ground her down and hope had become unimaginable. The year she received a new house she became a different woman. She has hope, she and her family are safe, and she knows, now, that someone cares.